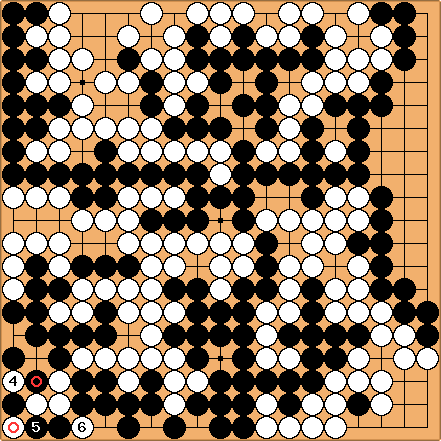 Warp: In game two of the 49th Honinbo league between Rin Kaiho (Black) and Komatsu Hideki, played on 1993-09-02, a very curious eternal life variant involving a ko happened, which resulted in the game being voided. I think it was called an "eternal ko". The position leading to this happened in the lower left corner (it's Black's turn, after exchanging for ). Black captures the ko with . White doesn't have any ko-threat elsewhere other than at , which naturally forces Black to capture at . Now, after White captures the ko with , Black doesn't have any other ko-threat besides , which forces White to capture at . After this black captures the ko again and the position repeats. Instead of White could capture the marked black stone, but that would result in a ko which White cannot possibly win (when Black captures the marked white stone), so it would not help White to do that. The game was declared void . . .
Robert Pauli: . . . but the game point nevertheless was split. Bill: Why do you think that, Robert? In a book by Lin the game ends with Chosei mushobu (Long life: no result). and each player awarded 1/2 point. Above, each side has 143 stones on the board, so each side has made the same amount of captives. Black counts 50 points (pretending the white stones in the lower left being dead), White 42 (ignoring his false eye), but since Black has to add three stones ('a', 'c', and 'e') and give 5.5 points komi, that's not enough. You can find a game record at GoBase, where you even can replay it. By the way, it's no coincidence that all ko threats were gone. To avoid losing by 0.5 points, Rin had to play hane in the upper left corner, leading to a game-deciding minimal ko there. After 22 flips (254 - 317) Komatsu played his second to last ko threat, in the lower left corner (1-1). Rin ignored it, filled the upper left ko, and . . . you know the rest of the story - unbelievable.